I am woefully behind on my homework. I am attempting to sculpt, mold, and cast a skin for the first time so I am a bit behind on my under skull. 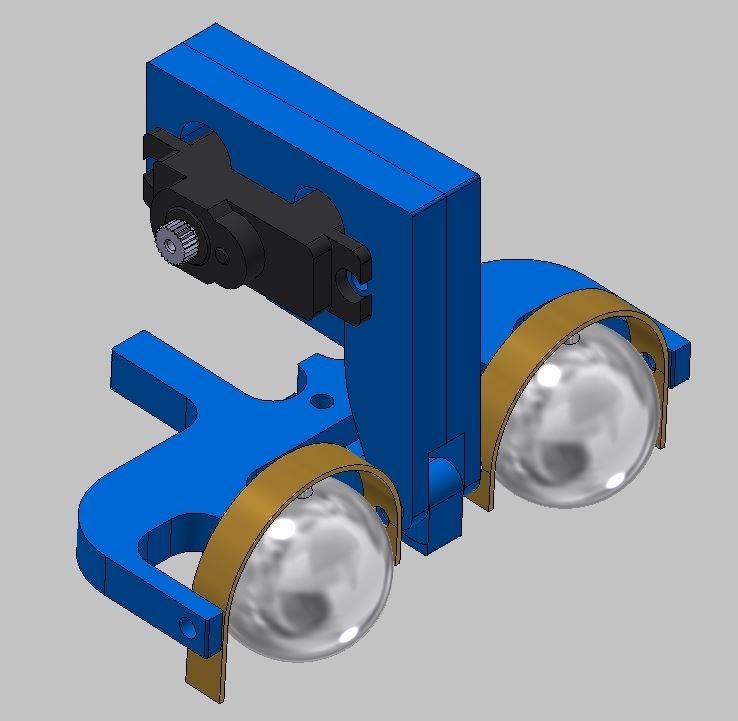 In the mean time, I have started to mock up my eye mech in Autodesk Inventor using basic dimensions from my head form. 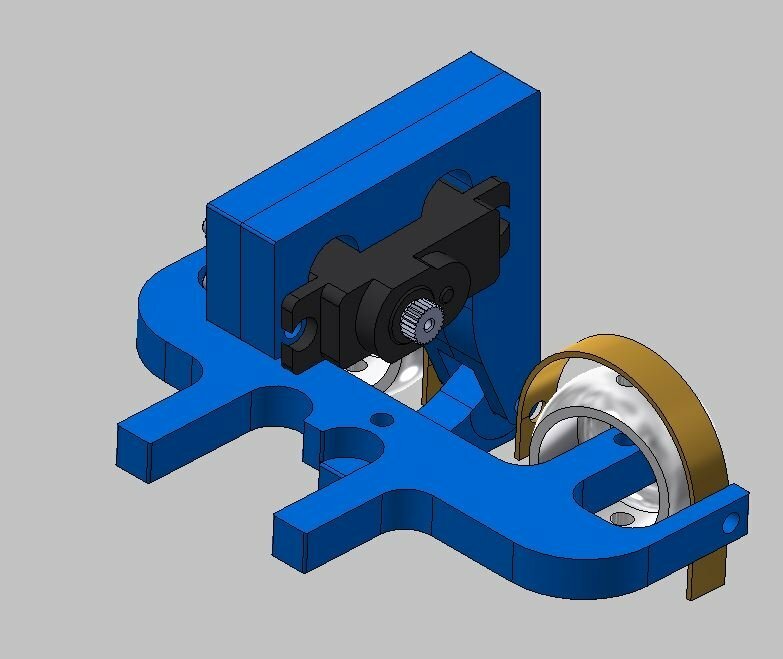 I plan to have the lever/mounting portions manufactured at work on a cnc mill out of either plywood or UHMW/colorcore plastic. What is everyone using to cast the skin? I do not have a dedicated oven to cook foam latex. What is the best alternative? Has anyone ever tried anything like Smooth on Flex It cold foam? This is a variation on the E frame.. right? I'm not going to cast skin. Just made an underskull. Too many things and expense needed for foamed latex. Very cool. I used Autodesk Maya to previz the animatronics for the web course. I have attached links with my completed project. I know still have a few things to fix on this project as listed below. I hope this is sufficient to count as completed homework. I have learnt a lot along the way and am looking forward to making a fully functional head with skin. This project started out as a generic face, but I may end up foam fabricating a snowman’s head as a “skin”. I am controlling the movements with a radio controller as I do not own a computer to hook the servos to. I cast this out of Smooth on 300 series resin. I was leery of introducing fiberglass into my house as my work station is my dining room table! I was pleased with how this came out for my first attempt. It machines really well and seems to be rigid enough not to deflect from the servos. You cannot put too much heat in it while machining or will start to become soft. I have a few minor interferences with the face plate that I need to sand down. In hindsight, I wish I had left more of a forehead or top of the skull to run my eyebrow wires along. I mounted the pushrod for the up and down eye movement under the left eye. This made the right eye seem to sag a bit. I would like to add a second servo to push under the right eye. I can link the left and right servos to the same control with a “Y” harness that way, they will move in tandem. One of my eyes does not move the right as well as it moves to the left. I need to increase the length on the linkage that reaches from the eye to the ball link. I also need to update the linkages to be perpendicular to each other (or more precise right angles to each other). My jaw is lopsided! I ran out of 2-56 ball end connectors and had to improvise. Not only did I run out of them, so did my local hobby shop! I am waiting on an order from Amazon to arrive. I left a wide gap for lips and teeth. It seems like almost have too much movement on my jaw. It does seem to have the ability to close too far and create an overbite effect. I also created channels in the backside of the jaw and faceplate in the event that I chose to add a skin and lip movement.